Buon Giorno. Our 2005 travels took us through some of the regions Lazio (Rome), Marches (Ascoli Piceno, Loreto, Offida and other towns), Umbria (Todi and Orvieto), Campania (the Amalfi Coast and Naopli) and Apulia (Otranto, Lecce, Polignano, Gallipoli and Martina Franca). Questo viaggio include l'evento de Amalfi - the part of our travels we call the Amalfi Event is there a group of friends met at the Piazza Navona in Roma, went for dinner and then on the next day traveled to the Amalfi Coast. Il itinerry è a sinistra - Each of the three weeks of the 2005 trip is listed to the left, Week Two has a link to the Amalfi Event. The map to the left gives an idea of our route. The Marches Region was very interesting. We found it to be more rugged than Umbria and Tuscany and as such, it took much longer to travel between various towns. We did not see all we had planned, and that just means another trip back to the area. 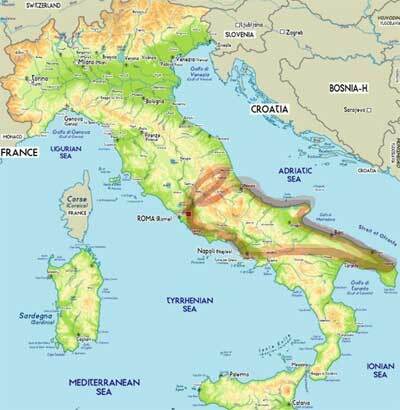 We believe the reports that there are less tourists in this area than other areas of Italy. It was great to feel that you were not part of a hoard of tourists. Very little english spoken in the majority of places we visited but with a small vocabulary you will get along just fine..
Umbria, located east of Tuscany and north of Rome became our "home" at the end of trip. When bad weather set in on the Adriatic Coast we made the decision to drive for a day and get from Apulia to Umbria in the morning. We found a great place to stay and now have another location that is close to Roma. Campania has Naopli, the Amalfi Coast, Pompeii, and as we saw the first time, Pasteum. .
Puglia, or Apulia in English, is the "boot heel" of the country - the southeast portion of Italy. This was our first visit to this Region of Italy. We had heard that it would be flat and uninteresting. Not so, yes for the most part flat, but the geographic is interesting and the cities and towns stunning and the people very friendly. Our trip is divided into three week segments, available by the menu on the left.